Citrus hystrix, called the kaffir lime, makrut lime (US: /ˈmækrɪt/, UK: /məkˈruːt/) or Mauritius papeda, is a citrus fruit native to tropical Southeast Asia and southern China. C. echinata St.-Lag. nom. illeg. Its fruit and leaves are used in Southeast Asian cuisine and its essential oil is used in perfumery. Its rind and crushed leaves emit an intense citrus fragrance. The etymology of the name "kaffir lime" is uncertain. The Arabic word for non-Muslims is kafir. jiàn yè chéng (箭叶橙) in Chinese. kabuyaw or kulubot in the Philippines, where the city of Cabuyao in the Laguna province is named after the fruit. makrud or makrut (มะกรูด) in Thailand (a name also used for the bergamot orange). trúc or chanh sác in Vietnam. In South Africa, "kaffir" is an ethnic slur for black African people. 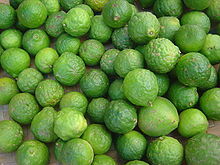 Consequently, some authors favour switching from "kaffir lime" to "makrut lime", a name less well established in English, while in South Africa it is usually simply referred to as "Thai lime". C. hystrix is a thorny bush, 2 to 11 metres (6 to 35 ft) tall, with aromatic and distinctively shaped "double" leaves. These hourglass-shaped leaves comprise the leaf blade plus a flattened, leaf-like stalk (or petiole). The fruit is rough and green, and ripens to yellow; it is distinguished by its bumpy exterior and its small size, approximately 4 cm (2 in) wide. The rind (peel) is commonly used in Lao and Thai curry paste, adding an aromatic, astringent flavor. The zest of the fruit, referred to as combava, is used in creole cuisine to impart flavor in infused rums and rougails in Mauritius, Réunion, and Madagascar. In Cambodia, the entire fruit is crystallized/candied for eating. The juice and rinds of the peel are used in traditional medicine in some Asian countries; the fruit's juice is often used in shampoo and is believed to kill head lice. The juice finds use as a cleanser for clothing and hair in Thailand and very occasionally in Cambodia. Lustral water mixed with slices of the fruit is used in religious ceremonies in Cambodia. C. hystrix is grown worldwide in suitable climates as a garden shrub for home fruit production. It is well suited to container gardens and for large garden pots on patios, terraces, and in conservatories. The compound responsible for the characteristic aroma was identified as (–)-(S)-citronellal, which is contained in the leaf oil up to 80 percent; minor components include citronellol (10 percent), nerol and limonene. From a stereochemical point of view, it is remarkable that kaffir/makrut lime leaves contain only the (S) stereoisomer of citronellal, whereas its enantiomer, (+)-(R)-citronellal, is found in both lemon balm and (to a lesser degree) lemon grass, (however, citronellal is only a trace component in the latter's essential oil). Kaffir/Makrut lime fruit peel contains an essential oil comparable to lime fruit peel oil; its main components are limonene and β-pinene. C. hystrix contains significant quantities of furanocoumarins, in both the peel and the pulp. Furanocoumarins are known to cause phytophotodermatitis, a potentially severe skin inflammation. One case of phytophotodermatitis induced by C. hystrix has been reported. Wikimedia Commons has media related to Citrus hystrix. ^ "TPL, treatment of Citrus hystrix DC". The Plant List; Version 1. (published on the internet). Royal Botanic Gardens, Kew and the Missouri Botanical Garden. 2010. Retrieved March 9, 2013. ^ "Citrus hystrix". Germplasm Resources Information Network (GRIN). Agricultural Research Service (ARS), United States Department of Agriculture (USDA). Retrieved December 7, 2014. ^ a b "Citrus hystrix". Flora & Fauna Web. National Parks Singapore, Singapore Government. Retrieved 13 August 2018. ^ "Citrus hystrix". Plant Finder. Missouri Botanical Garden. Retrieved 13 August 2018. ^ a b Ng, D.S.H. ; Rose, L.C. ; Suhaimi, H.; Mohamad, H.; Rozaini, M.Z.H. ; Taib, M. (2011). "Preliminary evaluation on the antibacterial activities of Citrus hystrix oil emulsions stabilized by TWEEN 80 and SPAN 80" (PDF). International Journal of Pharmacy and Pharmaceutical Sciences. 3 (Suppl. 2). ^ CRC World Dictionary of Medicinal and Poisonous Plants: Common Names, Scientific Names, Eponyms, Synonyms, and Etymology. M-Q. CRC Press/Taylor & Francis. 2012-01-01. ISBN 9781439895702. ^ Katzer, Gernot. "Kaffir Lime (Citrus hystrix DC.)". Gernot Katzer's Spice Pages. Retrieved 13 August 2018. ^ "Kaf·fir also kaf·fir". American Heritage Dictionary. Retrieved 18 September 2017. ^ Kuntal Kumar (1 January 2008). The Original Organics Cookbook: recipes for healthy living. TERI Press. p. 54. ISBN 978-81-7993-155-4. ^ a b c George Staples; Michael S. Kristiansen (1 January 1999). Ethnic Culinary Herbs: A Guide to Identification and Cultivation in Hawai'i. University of Hawaii Press. pp. 27–29. ISBN 978-0-8248-2094-7. ^ a b Loha-unchit, Kasma. "Kaffir Lime –Magrood". Retrieved December 7, 2014. ^ a b Sukphisit, Suthon (12 November 2017). "Clean up in kitchen with versatile fruit". Bangkok Post. Retrieved 13 November 2017. ^ "What to Replace Kaffir Lime Leaves With". Village Bakery. 2018-12-17. Retrieved 2018-12-19. ^ Wendy Hutton, Wendy; Cassio, Alberto (2003). Handy Pocket Guide to Asian Herbs & Spices. Singapore: Periplus Editions. p. 40. ISBN 978-0-7946-0190-4. ^ "Mauritian rum has a distinct character to it: Sweeter and smoother". The Economic Times. 2015-03-22. ^ Kasuan, Nurhani (2013). "Extraction of Citrus hystrix D.C. (Kaffir Lime) Essential Oil Using Automated Steam Distillation Process: Analysis of Volatile Compounds" (PDF). Malyasian Journal of Analytical Sciences. 17 (3): 359–369. ^ Dugrand-Judek, Audray; Olry, Alexandre; Hehn, Alain; Costantino, Gilles; Ollitrault, Patrick; Froelicher, Yann; Bourgaud, Frédéric (November 2015). "The Distribution of Coumarins and Furanocoumarins in Citrus Species Closely Matches Citrus Phylogeny and Reflects the Organization of Biosynthetic Pathways". PLoS One. 10 (11): e0142757. doi:10.1371/journal.pone.0142757. PMC 4641707. PMID 26558757. ^ Koh, D.; Ong, C. N. (April 1999). "Phytophotodermatitis due to the application of Citrus hystrix as a folk remedy". Br J Dermatol. 140 (4): 737–738. PMID 10233333.